Are you ready for Christmas? At STAMPlorations we're raring to go! We've got some gorgeous stamps and co-ordinating dies for you, along with some fabulous word and phrase dies. 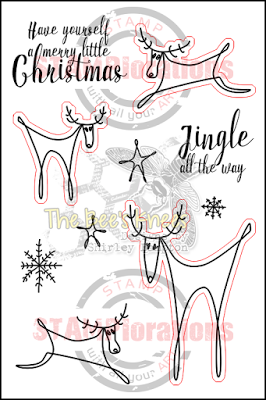 Today the focus is on my new set, Christmas Reindeers. I've also used two dies which you'll be seeing on Friday. The sky was a mixture of Distress Ink, water bleaching and white paint splattering. I couldn't stop at just one card, could I? This card also serves as a reminder for our CASEplorations challenge, where we are CASEing Ksenija's fabulous card. 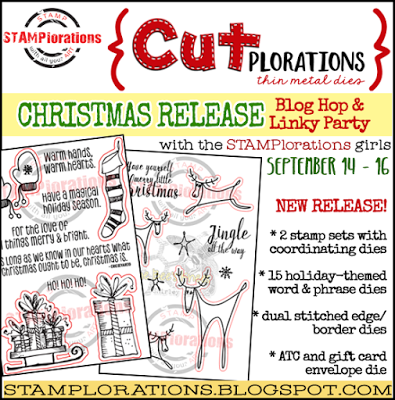 There'll also be a flash die-cut linky party where you can link up with any brand die-cut. So would that be you and kid? Or hubs and kid? Or you and hubs? ;) These are so cute and fun to create with. Kudos to ya. very sleek and neat looking reindeer! great creations! So cute and beautiful cards! Wonderful creations!! First, let me say, these reindeer you designed are freaking adorable. The sketchiness is right up my alley. And the cards you made with them amazing. Love the scene on the first with that gorgeous background and the second one on kraft just makes me smile. I'm in love with this reindeer set. And I love the way you are showcasing them! Love the sentiments and those cute-as-can-be reindeer! Delightful cards! Congrats on the stamp set, Shirley! Great sketchy look for the reindeer, beautiful cards! CONGRATULATIONS on having your designs transformed into stamps & dies that will be creating projects all over the world Shirley!!! 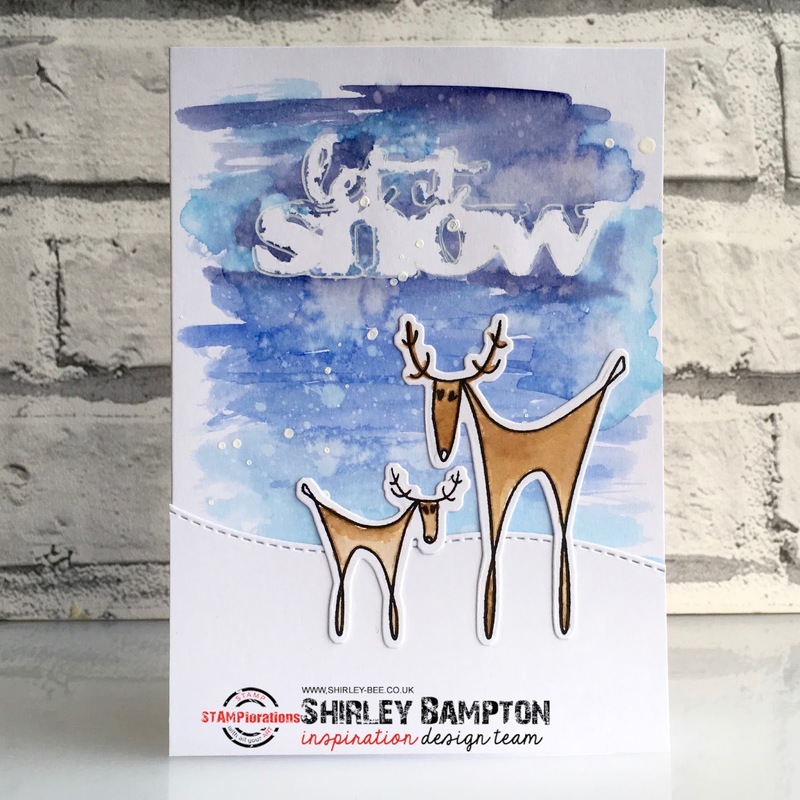 Awesome designs, reindeers look super fun to play with and your projects are fabulous. Shirley, what a great new set and I love the cards you have created with it! What a cute set you designed! This reindeer is adorable. Love your sweet & fun cards. Shirley, I'm light years behind in commenting! Starting fresh here, with a SQUEAL of delight at your awesome, darling, fantastic, ingenious little reindeer! Love them! Love your showcases! Beautiful cards. Love the images very much! Wonderful cards and a great case! to stay with a set idea. You did great designing this set. These reindeer cracked me up! I love their expressions and their 'loopy' legs! Fabulous job showcasing these cervids! great cards, I love your background on the first one!